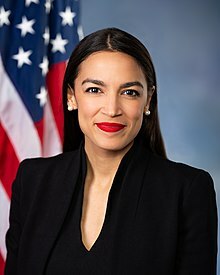 Alexandria Ocasio-Cortez (born October 13, 1989) is an American activist, community organizer, and politician. Ocasio-Cortez is the United States representative New York's 14th congressional district since January 3, 2019. She worked as an organizer for Bernie Sanders in his 2016 presidential campaign. On June 26, 2018, Ocasio-Cortez won the Democratic primary in New York's 14th congressional district, defeating incumbent Joseph Crowley in the biggest upset victory in the 2018 midterm election season. She ran on a progressive platform. Ocasio-Cortez is a member of Democratic Socialists of America. ↑ 1.0 1.1 Goldmacher, Shane; Martin, Jonathan (June 26, 2018). "Alexandria Ocasio-Cortez Defeats Joseph Crowley in Major Democratic House Upset". New York Times. Retrieved June 26, 2018. ↑ "A progressive insurgent just pulled off the biggest Democratic primary upset in years". Mother Jones. Retrieved 2018-06-27. ↑ CNN, Gregory Krieg,. "A 28-year-old Democratic Socialist just ousted a powerful, 10-term congressman in New York". CNN. Retrieved 2018-06-27. ...in the most shocking upset of a rollicking political season. ↑ Seitz-Wald, Alex (June 26, 2018). "High-ranking Democrat ousted in stunning primary loss to newcomer Alexandria Ocasio-Cortez". NBC News. Retrieved June 27, 2018. This page was last changed on 5 January 2019, at 22:34.